We were 5 on this trip: Robin, John, Martin, Felicity and me, and remarkably our 2 independent cars arrived within 1 minute of each other at the St Bees carpark at about 11:45am. I said Hello to another seakayaker in his car, and was greeted by a wall of pipesmoke when he opened his window. 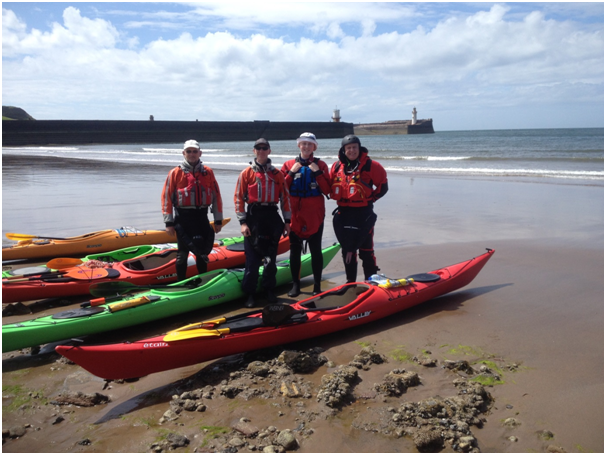 I drove with 5 kayaks on top to Whitehaven, and parked at a beach just North of the harbour where the C2C route starts. In the car park Robin showed us what the tide was doing in his 1” thick hardback Almanac, now summarised on his phone app. Felicity had planned to arrive in Kendal Friday night to adjust footrests in my new 2nd seakayak, a bright green Perception Essence. But she had a party to go to so had impressively managed to get the 6:30am train from Newcastle. Named Lime, or perhaps Cabbage, she will be the seakayak for whichever family member accompanies me in future, and this was her christening. Setting off about 1:15pm in bright sunshine, we had about 1-2 knots of current with us, but we had headwinds of at least Force 3 and a swell against us of up to 6’. We passed the ruins of an underwater coal mine on Saltom Bay and rounded the impressive St Bees cliffs, every ledge squawking with seabirds. We saw gannets, kittiwakes, puffins and others on the water, some flying very close as if to deter us. There was a bay just South of the Headland, where we found a narrow entrance not barred by rocks, so headed in there for lunch. Felicity’s backrests had slipped, which had made the paddle so far an abs exercise for her as she did sit-ups in the boat, so I did some first aid with string. Quite a scrapey landing and exit in the surf, but we all had plastic boats so were OK. We had chatted to the 2 other seakayakers coming from St Bees, surfing the swell in their composite boats, but they wouldn’t have landed here easily. Rounding the South Headland, the sea was confused but no overfalls, so slightly better than expected conditions. Here we practised towing and disposing of our towlines, quite tricky in a bouncing sea. The final part of the trip was great fun, playing in the surf on the beach. There were several swimmers in the party. Seakayakers rarely wear helmets, but they are a good insurance for surf, rocky landings, aggressive seabirds, rock-hopping, exploring caves and rain. We made it in about 5pm, after low water at 2:40pm. It had only been about a 6 mile trip but in tricky conditions. The forecast was for a Force 7 Southerly by 7 pm, but we missed that. On both trips the Low or High tide point was not still water. The current kept flowing North at Jubilee Bridge at high tide, and kept flowing South at St Bees at low tide. I still find it difficult to get my head around this. After about 30 trips over the years in Scotland, Wales, Brittany and locally in rented or borrowed boats, I bought my first seakayak and associated equipment in 2015. A red Valley Etain, christened Chilli by the kids, complementing Aubergine, a Corsica S, and Carrot, a Wavesport Y, already in the garage. Her first time in the water was at Brown Howe, where I didn’t do up my drysuit flies, so ended up with heavy flooded legs when attempting a self-rescue on the lake. Not an auspicious start. Today was her salt-water christening. 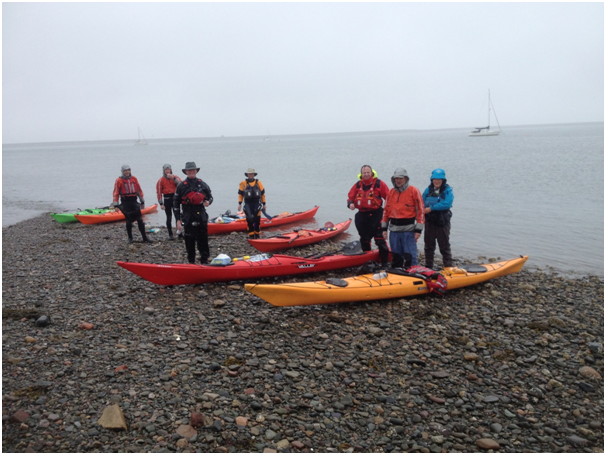 Despite only 4 people confirming the trip on the Forum, 8 seakayakers made it to Jubilee Bridge, Walney by 9:00am: Robin, Sten, Angela, Brian, John, Martin, Matt and me. We left 1 car there and travelled in 3 cars to Biggar. The sea was about 800m away so I assembled my plastic wheels for the first time. Are these the only manufactured goods export from New Zealand? They fit in a hatch, but not much room for anything else. It was hard work towing 2 boats on them so I was grateful when Sten came to the rescue with his wheels for the last bit. I was sweating profusely in my drysuit and needed to drink half a water bottle before we started. The day was overcast and windless with the sea flat like a mirror. Visibility was about half a mile, not a day for crossings without GPS unless you were an expert navigator. Setting off about 10:20am, we paddled South down the featureless Walney Island, pursued by inquisitive seals who popped up near us with increasing regularity. Lots of seabirds. The cloud was so low that you couldn’t see the top of the SMITE chimney in the shipyard. We were back at high water around 2:30pm to Jubilee Bridge, where the tide still flows north for a further 2 hours, Robin said. I found a bit of seaweed on the slipway that I could paddle fast up, but fell in as I got out of the boat. Good trIp, still lots to learn! At the next skills session, Robin suggested I try a re-entry self-rescue, rolling up with half a split blade, which would be a scenario with a lost or broken paddle. At polo the following evening, Robin said the magicseaweed buoy had indicated a swell of 6’ for Sunday. Now that would have been a different trip.